It’s the elusive thing that almost every adviser is looking for. Most have attended countless seminars, roadshows and conferences to unlock its secrets. Many advisers have bookshelves full of wisdom on the subject. But who is really achieving it? It’s a subject Consilium is very conscious of. Consilium is an outsourcing service provider to independent financial advisers across New Zealand. They offer a range of services, from platform to investment research, as well as a third party DIMS product. But perhaps the most important thing they do is help firms grow. 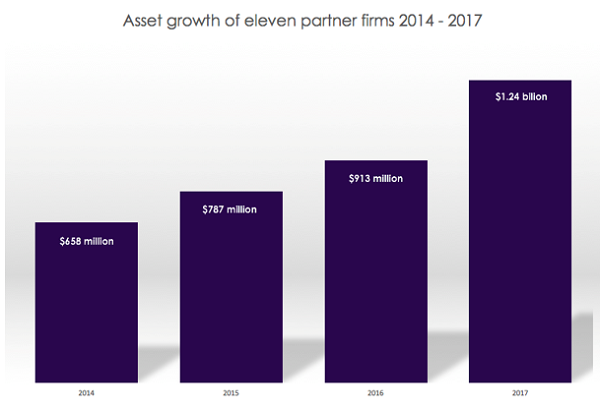 In August 2014, Consilium had eleven partner firms, which collectively had $658 million of funds under management. Three years later, those same firms have $1.24 billion under management. That’s growth of 24% per annum. One firm that started at $0 in 2014 now has over $80 million. Another with $5 million in 2014 now has over $50 million. And yet another, with $44 million in 2014, currently has about $115 million. Consilium knows something about growth, having grown from $259 million, when it separated from Bradley Nuttall in September 2012, to over $2 billion today across partner firm services, Consilium Platform and Synergy. Today, Consilium works with 22 partner firms, and 81 firms across all services. But what are the secret ingredients to helping these firms grow? And a compound adviser firm growth rate of 24% per annum suggests that’s true.